Shop the best selection of bulk stickers for kids! Hundreds of themes including Frozen Stickers, Inside Out Stickers, Mickey Mouse Stickers, Big Hero 6 Stickers, Doc McStuffins Stickers, Disney Princess Stickers, Star Wars Stickers, Minions Stickers, PAW Patrol Stickers, Teenage Mutant Ninja Turtles Stickers, Batman Stickers, Superman Stickers, Spider-Man Stickers, and more! Stock up with the best selling kids character stickers for party favors, scrapbooking, and birthday goody bags! 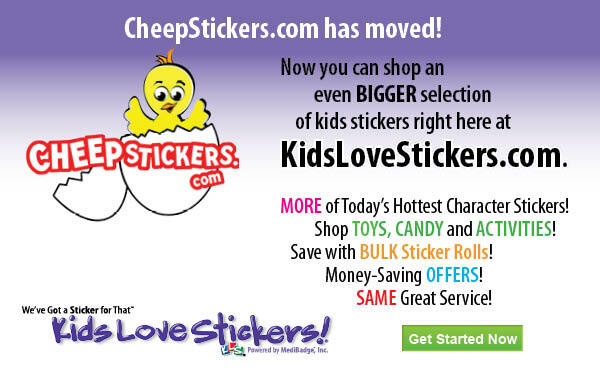 Shop Kids Love Stickers® and get More for Your Money every time you order. MORE Stickers…MORE Savings, with our Mix and Match Quantity Pricing. 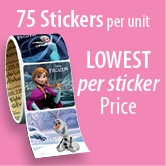 The more sticker units you order, the lower the unit price and the more you SAVE! Your unit price will automatically calculate as you add items to your shopping cart. LOWEST Per Sticker Price - With 90 stickers per unit (even on character stickers), plus our Mix & Match Pricing, you won’t find a better PER STICKER price anywhere. It’s true, we offer more kids stickers per roll than the leading competitor. 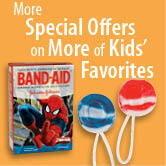 MORE of Kids’ Favorites to choose from – shop the best selection of bulk stickers, lollipops, character bandages and toys for kids. MORE Discounts - On top of our already low sticker prices, you can take advantage of frequent promotional discounts on our website, Facebook page and email offers. The savings really add up! Doctors and Dentists hand out to kids after their appointments. Stock up today with all their favorite Character Stickers and more. Click Here to Find Your STICKER for That™!